In looking through my quilts (and photos of quilts) for a recent article I wrote on CURVED SEAMS in pieced quilts, I came upon this WONDER. Curved seams, yes. Elongated points, yes. Skillfully made, yes. But WHERE did this unnamed quilt maker get the idea for this totally ORIGINAL DESIGN made circa 1930-40? The issue of sources and inspirations for quilt designs is a HUGE subject and will not be covered in this simple blog entry. 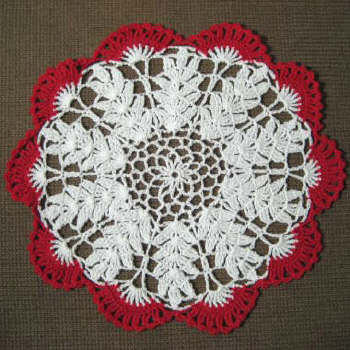 On this fantastic design, MY best guess for the quilt maker's model -- early 20th century crocheted doilies ! I think they look like they're based on movie reels from the movie theater. Thanks for the movie reeels idea. - "metal sewing machine bobbin,"
- "tomato/mozarella = caprese. but then it would have to an italian quilt :-)"
It looks to me like a science project - a physical representation of atoms, electrons and protons. 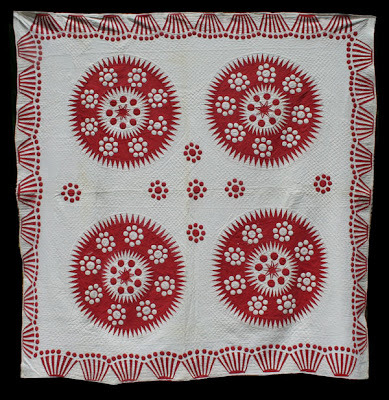 Quiltmakers, prior to the age of published patterns, got their designs from "the everyday objects around them." I guess some still did even in the early 20th century. 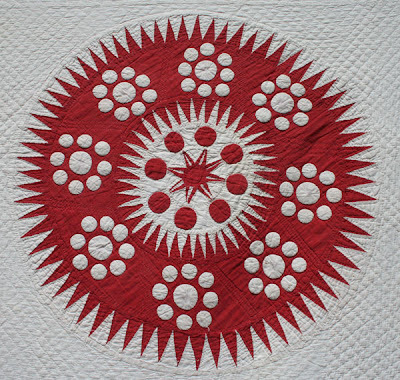 I love this quilt-I taught my children how to collect when they were really young by asking them to look for crocheted pot holders at the antique shops and flea markets that I attended. This taught them how to develop their "eye," and kept them busy so I could browse. And, it didn't cost me much money. I now have about 300 potholders. Never thought I would see a quilt that was based on one. This year I am using the red ones to decorate the Christmas tree. 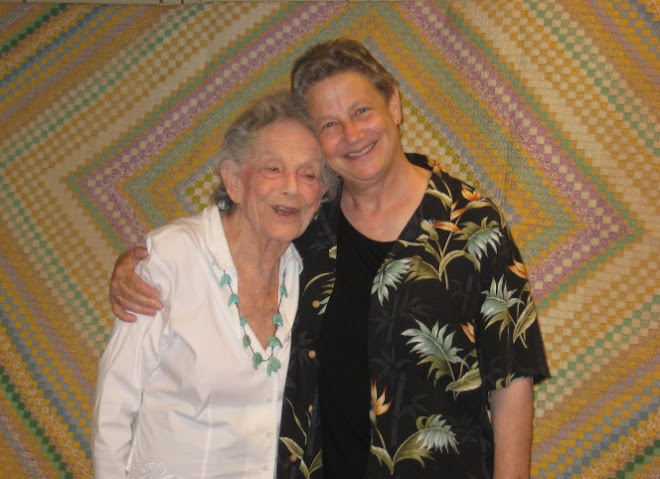 Isn't it fun to think about where the ideas or patterns came from for so many antique quilts I have seen. I thought your doily idea was brilliant, but I could see the movie reel suggestion too. Whatever the inspiration, it's a beautiful, unique design. Look into the center of the old fashioned flowers....many looked like parts of this quilt. My goodness its a beauty! Hi Julie, Maybe this talented quilt maker used her imagination and incorporated elements from other designs she'd used in the past into her own unique plan. I can see this design evolving as she added more elements to the blocks. 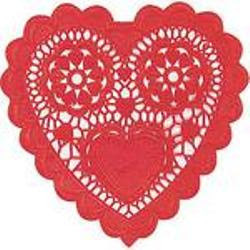 I like your idea of the crocheted doilies as inspiration. It's a distinct possibility. What I like about old quilts is that we can make guesses of all sorts and never truely know for sure. 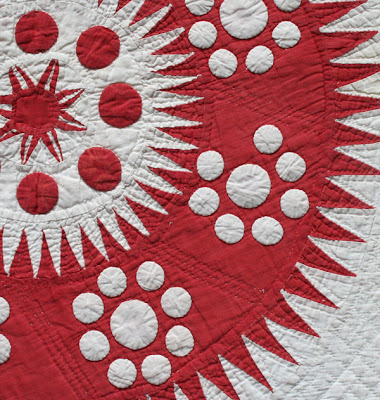 I am always attracted to red & white quilts and this one is a beauty!